So with the so many days in Spain spent not in Barcelona, we actually didn't have much time to explore Barcelona itself. In our last day in Barcelona, we were leaving for Milan at 7.30 pm something. It kinda gave enough time to see a few things but I wasn't really sure if I could see all the things that I wanted to see. 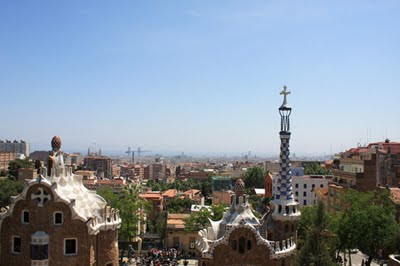 Initially I thought I was just going to visit Casa Milà (La Pedrera) and Park Güell. Obviously Park Güell is a must and from my reading La Pedrera seems interesting as well. Then I was thinking if it's possible to visit the Picasso museum as well. I happened to meet Carl before the trip and she spoke about how she liked Casa Batlló so much and so I put that into the list. I took note of the metro station in each place, thinking I would just take the metro but Mau decided that she was going to take the hop on / hop off bus, especially after being told by the Australian tourists, who took the Provence tour with us, of how convenient the buses were. I got swayed, so I took it as well. It is very very convenient. There are 3 routes and there are a lot of stops all over Barcelona. You just hop in and hop off anywhere you like. I think it might worth more to get the 2-day pass for 30 euro than the 1-day pass at 23 euro. I don't think you can cover the whole 3 routes of the bus in one day and still stop at places to see some things. I didn't even have time to try the green line. It's really really worth the money and the staff were really really friendly :) The guy at booth made me smile when I got my ticket. Again since our hotel is by Plaça de Catalunya, we just needed to cross the street to go to the booth to get our tickets and got on the bus. Both Mau and me took the blue bus but we had different things that we wanted to see. I was off the bus in the first stop. First stop was Casa Batlló. I LOVE Antoni Gaudí. You can call him quirky or such but I love his design aesthetic. I think we match :P There are so much details in what he did. There are curves in the handle of the stairs so that they fit your hands perfectly. There are different mosaic glass on the windows which will change colors as the light goes through them. The walls are tiled in blue tiles which goes in gradient of light blue to darker blue. There are glass panel which will reflect those tiles like reflection on the water. The chimneys are not just chimneys, they are pieces of arts, colorful and wonderful. The colors, I love the way the colors are. I love everything about this house and I think a house should be like this, unique and fun! I really love everything he did. Barcelona is really a Gaudí's city and I'm sure I haven't seen all that he did but from all the things that I saw, I love them all. 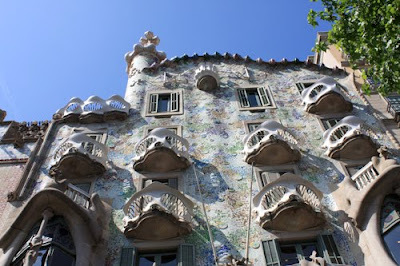 To see my pictures of Casa Batlló, you can go here. 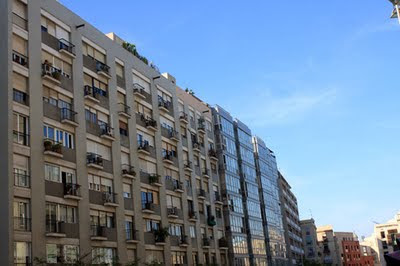 By the way, look at this picture of its exterior facade, look at the details of the walls and balconies, pretty! It's a well managed house too. I saw some people fixing the mosaic and they did it with such care and in a really meticulous way. After Casa Batlló, the next stop in the blue bus is Casa Milà or more famously known as La Pedrera. It is very very near. 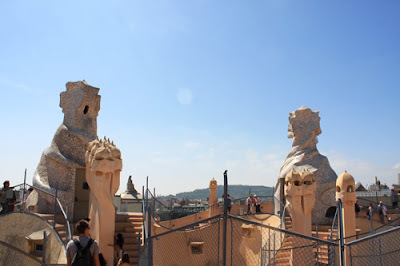 You start exploring La Pedrera with the roof. There's actually elevators but stupid me took the staircase because I thought there are some things to see in the floors reaching the roof but the way you visit the place is designed so that you start with the roof first. Reaching the roof, I was impressed but at the same time not so blown away. I guess it's because you came from the colorful roof and home of Casa Batlló and then you reached La Pedrera where the chimneys are more in a brown color without much mosaics on them. It's still a stunning and incredible roof because all the figures are interesting. You see faces on them and you can't help but smile a bit seeing them. I think the roof is bigger and there are stairs all around so walking up and down may get you tired but of course all the energetic kids were running around excitedly. After the roof you go down to see the apartments and the rooms that were used by the people who used to live there. Some of the items were really really cute. I feel that it's also another nice place to live in. I can imagine going to the roof as the sun was setting down or rising, it must be so beautiful up there. It would great if I can live in building like this. The pictures are here. Here you can see the picture of the roof. My next stop was Park Güell. Well the bus stop to the park is not so near, you kinda have to walk up. I stopped for lunch because I needed the fuel :P I had meat on skewers, fried eggs, and fries. The meat was scarily a lot but it was good :P Anyway first impression of Park Güell was that it's unique. You see the stairs from the entrance and you can sense that it's something different and unique. Then you turn your back and see the 2 houses at the entrance, very unique houses. I guess the only thing I don't like is that there were just too many people and I hate that but I guess the park will never really be empty of people. There are many many interesting parts of the park. I love the mosaics, I just love them! There were many artists, many musician, so there were a lot of different musics playing. You also have people selling many stuff and there were also artists who paint. If you hike up a bit more, you get away from all the crowd below and see more greeneries. I didn't hike all the way up because the paths were rather steep and it was rather hot and I didn't know how far it would lead me and I didn't want to stray too far and end up taking too much time to get back. The quiet moment up there was really really nice for me. I just love the peace and you got to see Barcelona. It's wonderful. Many people have told me to be careful in Barcelona because of the pick pockets and I remember Yeni telling me that there were pick pockets going into her bags so I didn't fancy having a lot of people there and the park really lived up to that bad stigma unfortunately. I saw a caucasian tourist chasing after one of the people who were selling stuff, they were running so fast that it gave me a shock. Then some minutes later, again I saw people running away from something. It's very very unfortunate that the park is not so safe :( I didn't feel like I want to stay there long but that was also attributed because there were just too many people to make it a pleasant visit. Sometime I wonder if me being alone roaming around kinda caused all these bad people to pity me and not target me. Well I do make it a point not to open the map in public and look obviously like a tourist. Maybe some think that I'm just an exchange student and perhaps they think just don't hassle to solitary girl there :P Whatever it is, I am thankful that God always protect me on my way. Pictures of Parc Güell is here. This is the picture of the 2 houses at the entrance. The one on the left made me think of a gingerbread house. Gaudí was really really religious, you can almost always see crosses in all his works and I really admire his devotion. So that's it peeps, the Spanish stories. I seriously felt rather sad about leaving Barcelona even though we were heading to Italy. I just felt that I haven't gotten enough of it. Anyway we took our overnight train to Milan. When I saw our room it was actually small and it made me rather sceptical. We saw 2 seats there and so I wonder where's the bed. Well there are beds but you need to get the staff to set it for you and the lady set it up for us when we went for dinner. I was impressed when I got back from dinner to see the bunk beds. I'm very bad at taking pictures of things like these, hotel rooms and the meals we had because it just didn't come to my head that I should take pictures :P Let's just settle and say that I was really impressed. Well that is before I watched Japan Hour recently in Channel News Asia and their overnight trains were so much better! So I guess our train and room were so so but I still love it and I had a good night sleep and I'll do it this way again :) More stories in the next post okay, ciao!